During the last weekend in September, Tom and I had a fantastic opportunity to speak at two grassroots activist meetings in New Jersey. While New Jersey is a deep blue state, there are thousands of passionate patriots that are motivated to move the state in a conservative direction. 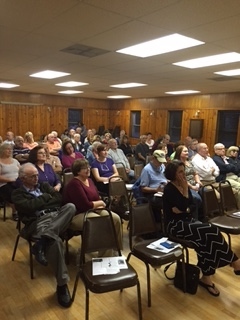 On September 26, we spoke at the Americans For Liberty meeting in Whippany, New Jersey. The members of this organization were extremely receptive to our speeches that addressed Obama’s failed energy policy and America’s Exceptionalism. We had a great time interacting with the attendees and discussing the local and national issues challenging our country. On September 27, we participated at the Concerned Citizens of Southern New Jersey’s “No More Common Core” symposium. Our presentations described how billionaire Bill Gates used his fortune to drive Common Core standards throughout the U.S. and the negative impact it will have on the country’s children. Recognizing the importance of grassroots activism, the organizers urged the attendees to contact their representatives including Senate President Steve Sweeney to urge him to allow a vote on a bill that would delay the results of tests to rate teachers and schools. While our country has numerous challenges, we are confident that the actions of grassroots activists like the individuals we met this weekend will get us moving in the right direction. We always find it extremely gratifying to spend time with activists around the country and we were very appreciative for the warm reception we received in New Jersey.